YANGON/BANGKOK — Rapid urbanization in and around Myanmar’s southern city of Yangon has turned up the pressure to develop goods and services that can meet the rising demand. The gap has provided an opening for companies in one of Southeast Asia’s least-developed countries. 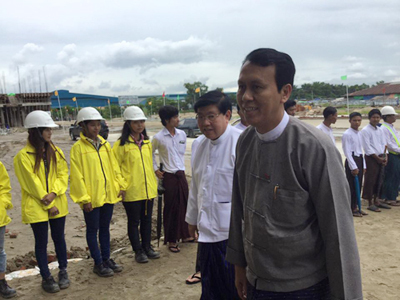 Local real estate and construction conglomerate Dagon International set up a modern farmers’ market in Yangon in January with the city’s urban development bureau. The new open-air market sits on a 13 hectare, concrete-covered plot with spacious parking lots. The market’s 10-meter-tall roof is high enough to allow breezes in. The floor is several dozen centimeters high to facilitate loading and unloading onto small trucks. 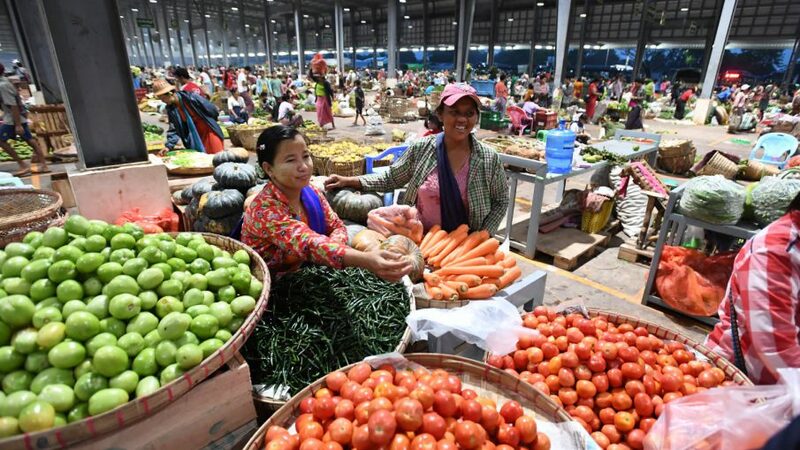 But the new market “gives me ample space for business,” said a vendor selling tomatoes grown in Shan State in the country’s north. A cargo railway base is expected to be set up nearby. Updates to the country’s north-south railroad will boost transport capacity, making it possible to more quickly ship fresh food from the farmlands in the country’s northern and central areas to population centers. Democratization started in 2011 kicked off rapid economic growth. Areas around Yangon, the country’s commercial center and biggest city, have been quickly undergoing urbanization, and the population is expected to double from roughly 5 million at present to 10 million by 2040. To feed the growing population, the city will need fresh foods brought in from outside. The middle class is expanding fast. Yangon’s per-capita gross domestic product is about 50% above the national average. Many restaurants are now charging two to three times traditional prices. Deregulation has given the green light to supermarket operators 100% controlled by foreign owners. Demand is rising for high-quality food, and many companies see the business opportunity. Farming employed nearly half of Myanmar’s workers in fiscal 2017, but accounted for just a quarter of GDP, according to World Bank data. To help enhance the wealth of its citizens and develop the economy, Myanmar needs to increase the added value of agriculture products so that they can be sold for higher prices. The government has pledged to support peripheral industries to enhance the value of farmed goods, saying in its development strategy manifesto released earlier this month that the advancement of distribution and processing industries is critical to the country’s agricultural development. While ensuring an adequate food supply for middle-class urbanites is one priority, the government also seeks to improve the country’s competitiveness in exports. Businesses are working to ramp up exports of fresh produce. A joint distribution company owned by Japanese food trading house Kokubu Group and Myanmar conglomerate Serge Pun & Associates has expanded its fleet of low-temperature trucks to 35 from just 15. The trucks deliver such items as mangoes to Yangon’s port and airport. Once there, they are shipped off to hungry consumers in Singapore, China and the Middle East.